sraeli Occupation Forces (IOF) carried out over the past month 2515 violations in West Bank and Jerusalem, Hamas Information Office reported. Israeli forces continued with systematic crimes in the occupied Palestinian territory (oPt) for the week of 26 July – 01 August, 2018. Israeli forces continued to use force against peaceful Palestinian protestors in the Gaza Strip. 3 Palestinian civilians, including 2 children, were killed in the southern Gaza Strip. 138 Palestinian civilians, including 28 children, 2 women, a journalist, and 6 paramedics, were wounded; 22 of them sustained serious wounds. Fifty-one Palestinian civilians, including 4 children, were wounded in the West Bank; 40 of them were wounded in Al-Aqsa Mosque yards. Israeli forces continued to use lethal force against Palestinian civilians, who participated in peaceful demonstrations organized within the activities of the “Great March of Return and Breaking the Siege” in the Gaza Strip, which witnessed for the 18th week in a row peaceful demonstrations along the eastern and northern Gaza Strip border area. During the reporting period in the Gaza Strip, the Israeli forces killed 3 Palestinian civilians, including 2 children. Moreover, the Israeli forces wounded 138 others, including 28 children, 2 women, a journalist, and 6 paramedics. Twenty-two of those wounded sustained serious wounds. In the West Bank, the Israeli forces wounded 51 civilians, including 4 children; 40 of them were wounded in al-Aqsa Mosque yards in occupied Jerusalem. In the Gaza Strip, on 27 July 2018, Israeli forces killed 3 Palestinian civilians, including 2 children, while participating in the Return and Breaking Siege March. Majdi al-Satari (12) and Mo’min al-Hams (17) were killed while participating in the demonstrations organized in Rafah, while Ghazi Abu Mustafa (43) was killed while participating the a demonstrations organized in Khan Yunis. 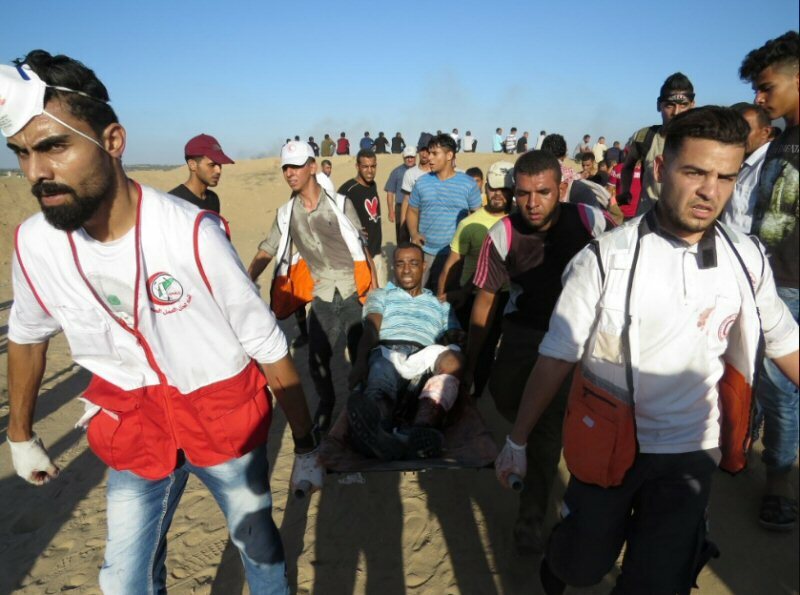 During the reporting period, while using the excessive force against the peaceful protesters along the Gaza Strip borders, the Israeli forces wounded 138 Palestinian civilians, including 28 children, 2 women, a journalist, and 6 paramedics. Twenty-two of those wounded sustained serious wounds. As part of targeting the border areas, on 26 July 2018, Israeli forces stationed along the border fence between the Gaza Strip and Israel, east of Dir al-Balah in the centre of the Gaza Strip, opened fire at agricultural lands. On 27 July 2018, an Israeli artillery fired a sell at an empty land, east of Jabalia, north of the Gaza Strip, and no injuries were reported. As part of targeting Palestinian fishermen in the Gaza Sea, the Israeli forces continued to escalate their attacks against the Palestinian fishermen, pointing out to the ongoing Israeli policy of targeting their livelihoods. During the reporting period, PCHR documented 7 shooting incidents at the fishermen, including 6 in the northern Gaza Strip and 1 in the centre of the Gaza Strip. In the West Bank, Israeli forces wounded 51 civilians, including 4 children; 40 of them were wounded in al-Aqsa Mosque yards in occupied Jerusalem. During the reporting period, Israeli forces conducted at least 79 military incursions into Palestinian communities in the West Bank and 9 similar ones into Jerusalem and its suburbs. During those incursions, Israeli forces arrested at least 52 Palestinians, including 4 children, in the West Bank. Meanwhile, 38 other civilians, including 12 children, were arrested in Jerusalem and its suburbs. Among those arrested were 5 journalists; 4 of them work at al-Quds Satellite Channel while the last one works as a Director of Hawa Nablus Radio and a reporter at Quds News Agency. In the Gaza Strip, on 30 July 2018, Israeli forces moved into Return encampments, east of Abu Safiyia Hill, northeast of Jabalia, north of the Gaza Strip, and levelled lands, which are previously levelled. Following the Friday prayer, on 27 July 2018, Israeli forces raided al-Aqsa Mosque in occupied East Jerusalem’s Old City, and turned it into a military barrack after surrounding it, closing it for 4 hours, forcibly evicting its yards, attacking Palestinian worshipers, firing rubber bullets and sound bombs at them, and beating and pushing them. As a result, around 40 worshipers sustained sound bombs and rubber bullets shrapnel wounds. Moreover, about 22 worshipers, including 7 children, were arrested after getting out of the mosque and some of them were arrested from al-Qibali Mosque. As part of demolishing houses and civilian facilities, on 31 July 2018, Israeli forces notified the owners of 7 houses in al-Walaja village, northwest of Bethlehem, to demolish their houses, under the pretext of non-licensing. Khadir al-‘Araj, Head of al-Walaja Village Council, said that Jerusalem Municipality staff distributed 7 notices to the owners of these inhabited houses. As part of settlement activities in occupied Jerusalem, on 01 August 2018, the Israeli authorities opened a new settlement project in Silwan village, south of occupied East Jerusalem’s Old City, to serve Israeli settlers, under the name of ” Jewish Yemeni Heritage Center”. It should be noted that the Israel authorities opened the settlement project in Abu Nab property, which is built on an area of 700 square meter and seized in 2015. As part of demolishing crimes, on 29 July 2018, Israeli forces demolished a barrack built of tin plates in al-Shareef area in Kherbit Tuba, east of Yatta, south of Hebron. The 150-square-meter barrack belonging to Tawfiq ‘Awad was used for breeding livestock. The barrack was demolished under the pretext of non-licensing in area classified as Area C.
On 01 August 2018, Israeli forces demolished unused graves built of concrete in the Western Ahrash area in al-‘Aroub refugee camp, north of Hebron. As part of settlement activities and attacks by settlers against Palestinian civilians and property, on 27 July 2018, a group of Israeli settlers from “Yish Kodesh” outpost established in eastern side of Jaloud village, southeast of Nablus, attacked Palestinian civilians’ houses in al-Khila al-Wasta area, east of the village. The Israeli settlers set fire to an under-construction house and attacked another house after destroying its main door and damaging its contents. On 28 July 2018, three Israeli settlers attacked Samir Mutlaq Ibrahime Ghanem (39) and his wife, Lina, with pepper gas and contaminated water while returning home in Tal al-Ramida neighborhood in Hebron. The Israeli forcrs did not intervene to stop them. Samir and his wife were taken to Hebron Governmental Hospital for treatment. On 30 July 2018, a group of Israeli settlers from “Adi Ad” outpost established on al-Magheer village’s lands, northeast of Ramallah, moved into the outskirts of the village from the northwest side. The Israeli settlers burned tires of 8 Palestinian vehicles and wrote racist slogans on the walls of the houses calling for revenge and killing the Palestinian civilians. The Israeli settlers later withdrew. At approximately 16:00 on Friday 27 July 2018, hundreds of civilians swarmed to the Return encampments established by the Supreme National Authority for the Great March of Return and Breaking Siege, east of Khuza’ah village, east of Khan Younis. The numbers of participants increased at approximately 16:30, as the participants gathered inside and outside the encampment’s yard and raised flags, chanted national slogans and flew dozens of kites and balloons as dozens of them, including women and children, approached the border fence between the Gaza Strip and Israel and set fire. A number of them attempted to throw stones at Israeli forces. The Israeli snipers stationed behind sand barriers and hills, more of which were established this week, along the border fence between the Gaza Strip and Israel, deliberately and selectively opened fire at participants of the peaceful demonstrations that included hundreds of civilians. On this week, the shooting was more than firing tear gas canisters, which were limitedly used in the last 2 hours of the demonstration by the military vehicles and drones. The shooting, which continued until approximately 20:00, resulted in the killing of Ghazi Mohammed Mustafa Abu Mustafa (43), from Khan Younis, after being hit with a live bullet that penetrated the right side of the head and exited the left ear at approximately 16:30, as he was sitting under an olive tree, which is about 150 meters away from the border fence. Ghazi’s death was announced after half an hour of his transfer to Gaza European Hospital. It should be noted that Ghazi was wounded to the left leg by Israeli forces on 08 June 2018, and he walks on crutches since his injury. Moreover, 10 others, including a child and a woman were hit with live bullets and its shrapnel throughout their bodies. The wounded civilians were taken to the field hospital and then transferred to Nasser, Gaza European and Algerian Hospitals. Dozens further suffered tear gas inhalation and received medical treatment on the spot or at the field hospital. Some of them were transferred to hospitals due to suffering severe tear gas inhalation and seizures. At approximately 16:00 on Friday, 27 July 2018, thousands of civilians swarmed to the Return encampments established by the Supreme National Authority for the Great March of Return and Breaking Siege, east of Malakah intersection, east of al-Zaytoun neighborhood, east of Gaza City in the 18th consecutive Friday titled “Our Martyrs Children.” The activities included raising flags, chanting national slogans, setting fire to tires and flying kites. Though the demonstrations were fully peaceful, Israeli forces stationed behind the border fence between the Gaza Strip and Israel deliberately and randomly fired live and rubber bullets and tear gas canisters at them. As a result, 22 civilians, including 3 children, were wounded. Nineteen of them were hit with live bullets and its shrapnel and 3 were hit with tear gas canisters. Around the same time, hundreds of civilians swarmed to the Return encampments established by the Supreme National Authority for the Great March of Return and Breaking Siege, 400 meters away from the border fence between the Gaza Strip and Israel, east of al-Buraij in the central Gaza Strip. Dozens of them approached the border fence, set fire to tires and threw stones at Israeli soldiers stationed behind sand barriers along the border fence. The Israeli forces fired live bullets and tear gas canisters at the participants. The clashes continued until approximately 20:00 on the same day. As a result, 15 civilians, including 3 children, were wounded. Thirteen of them were hit with live bullets and 2 others were hit with tear gas canisters. The wounded civilians were taken via ambulances belonging to Palestine Red Crescent Society (PRCS) to al-Aqsa Hospital in Deir al-Balah. Doctors classified 3 civilians’ injuries as serious and they were then transferred to al-Shifa Hospital in Gaza City. The injuries of the other wounded civilians were classified between minor and moderate. Ahmed Abdul Bari al-‘Abed Abu Foul (34), a volunteer paramedic at PRCS, was hit with a tear gas canister to the neck. At approximately 17:00, hundreds of Palestinian swarmed to the Return encampment established by the Supreme National Authority for the Great March of Return, east of al-Shawkah village, east of Rafah in the southern Gaza Strip. A number of young men approached the border fence, flew kites, set fire to tires and threw stones at Israeli soldiers stationed behind the border fence. The soldiers fired live bullets and tear gas canisters at the protestors. The clashes continued until approximately 20:30. As a result, Majdi Ramzi Kamal al-Satri (12) was killed after being hit with a live bullet that entered the front and exited the back of the head. Majdi died in the ambulance that transferred him from the field hospital in the Return encampment to Gaza European Hospital in Khan Younis. Moreover, 30 civilians, including 6 children, were wounded. Twenty nine of them were hit with live bullets and its shrapnel and one civilian was hit with a tear gas canister. Those wounded civilians were taken to the field hospital and then transferred to Abu Yusuf al-Najjar Hospital in Rafah and Gaza European Hospital in Khan Younis. Doctors classified the injuries of 3 civilians as serious. At approximately 05:00 on Saturday, 28 July 2018, medical sources at Gaza European Hospital announced the death of Mo’men Fathi Yusuf al-Hams (17), succumbing to his wounds. Mo’men was hit with a live bullet that entered the left shoulder and exited the chest. Mo’men underwent a Surgery that continued for 5 hours and then stayed at the ICU until his death was announced. At approximately 16:00 on Sunday, 30 July 2018, dozens of Palestinian children and young men gathered near the border fence between the Gaza Strip and Israel, east of al-Buraij in the central Gaza Strip, to participate in the Return encampment. They threw stones at Israeli soldiers stationed behind sand barriers along the b order fence. the soldiers fired live bullets and tear gas canisters at them. As a result, 2 children were hit with live bullets to the lower limbs. They were transferred via a PRCS ambulance to al-Aqsa Hospital in Deir al-Balah. Doctors classified their injuries as moderate. At approximately 13:40 on Friday, 27 July 2018, a group of Palestinian civilians moved from Kufor Qaddoum village, northeast of Qalqiliyah, to the eastern entrance to the village, which has been closed for 15 years. The protestors chanted national slogans demanding end of occupation, condemning the decisions to demolish Khan al-Ahmer Bedouin Community and condemning the Israeli forces’ crimes against Palestinian protestors along the eastern border of the Gaza Strip within “The Great March of Return and Breaking the Siege” activities. Several representatives of national factions and representatives of National Action Factions in the north of the West Bank and a number of foreign and Israeli activists participated in the demonstration. Israeli soldiers suppressed the demonstration and fired live and rubber bullets, sound bombs and tear gas canisters at them. As a result, 5 civilians, including a 3 children age between 12 and 13, was hit with a live bullet shrapnel to the left hand. At approximately 16:40 on Saturday, 28 July 2018, a group of Palestinian organized a peaceful demonstration from the center of Kufor Qadoum village, northeast of Qalqiliyah and headed to the eastern entrance, which has been closed for 15 years. Israeli forces opened fire at the protestors. As a result, a 40-year-old civilian was hit with a rubber bullet to the right hand. At approximately 07:00 on Tuesday, 31 July 2018, Israeli forces notified the owners of 7 houses in al-Walaja village, northwest of Bethlehem, to demolish their houses, under the pretext of non-licensing. Khadir al-‘Araj, Head of al-Walaja Village Council, said that an Israeli military force accompanied with the Jerusalem Municipality staff moved into ‘Ein al-Jwaiza neighborhood in al-Walaja village. The municipality staff distributed 7 notices to the owners of these inhabited houses. The notices included summonses for the houses’ owners forcing them to self-demolish their houses, or they will be forced to pay the demolition costs. Al-‘Araj pointed out that the neighborhood, which is adjacent to al-Malha village that its residents were evicted, is clearly targeted in order to be fully annexed to the Jerusalem Municipality boundaries. It should be noted that the Jerusalem Municipality, during the past 30 years, attempted to annex the neighborhood. The Israeli authorities are also seeking to deport the neighborhood residents in favor of expanding the Israeli settlement as a prelude to add 330 settlement units in “Har Gilo” settlement established on the village lands. The Israeli forces also demolished al-Nour Mosque in the same neighborhood 20 years ago and destroyed the paved street that connects the neighborhood with the rest of the village. Additionally, they demolished over 30 houses and there are about forty cases in the Israeli Courts due to issuing demolition notices against those houses. On Wednesday evening, 1 August 2018, Israeli forces moved into Silwan village, south of occupied East Jerusalem’s Old City, and turned it into a military barrack. This happened in coinciding with opening a new settlement project in the village to serve the settlers, under the name of ” Jewish Yemeni Heritage Center”. According to eyewitnesses, a large force of Israeli soldiers moved into the neighborhoods and stationed at its entrances. They then deployed in Batn al-Hawa, al-Wosta, al-Bostan, and ‘Ein al-Lawza neighborhoods and closed some streets and roads to facilitate the access of participants to the opening ceremony of the settlement project. The eyewitnesses also said that before the beginning of the ceremony, the Israeli forces, arrested Zuhair al-Rajabi, Head of Batn al-Hawa Committee, and Jawad seyam, Head of the Wadi Helweh Information Center, while they were in the neighborhood. After that, the Israeli forces evicted the streets, forced the residents to enter their houses, and kept the press crews and some of foreign and Israeli activists away from the area. Meanwhile, they prevented Silwan village’s residents from heading to the neighborhood and many residents were prevented from reaching their homes. Ze’ev Elkin, Jerusalem Affairs and Heritage Israeli Minister, Miri Regev, Israeli Minister of culture, Rabbi of Jerusalem, and representatives of the settlement associations participated in the opening Ceremony of the Cultural Center. It should be noted that the Israel authorities opened the settlement project in Abu Nab property, which is built on an area of 700 square meter and seized in 2015. Last year, a synagogue was built in the same property, in which Israeli authorities claim that the property was a synagogue for the Jews of Yemen in the late 19th century. At approximately 9:00 on Sunday, 29 July 2018, Israeli Border Guard officers, accompanied with a vehicle of the Israeli Civil Administration and a bulldozer moved into al-Sharif area in Khirbet Tuba, east of Yatta, south of Hebron. The Israeli forces deployed in the area while the bulldozer demolished a 150-square-meter barrack built of tin plates and used for breeding livestock. The barrack belongs to Tawfiq Isma’il ‘Elyan Awad. The barrack was built in 2016 and demolished under the pretext of non-licensing in areas classified as Area C. Tawfiq was notified to stop construction on 23 April 2017. At approximately 8:00 on Wednesday, 1 August 2018, Israeli forces backed by 2 military vehicles and accompanied with a vehicle of the Israeli Civil Administration and a bulldozer moved into the western al-Ahrash area in al-Aroub refugee camp, north of Hebron. The bulldozer demolished a number of unused graves built of concrete under the pretext of non-licensing in an area classified as security area by the Israeli forces. It should be noted that the Israeli forces previously notified to hold construction in these graves. At approximately 22:00 on Monday, 26 July 2018, a group of Israeli settlers, under the Israeli forces’ protection, moved into al-Nabi Yunis neighborhood, north of Halhool village, north of Hebron. 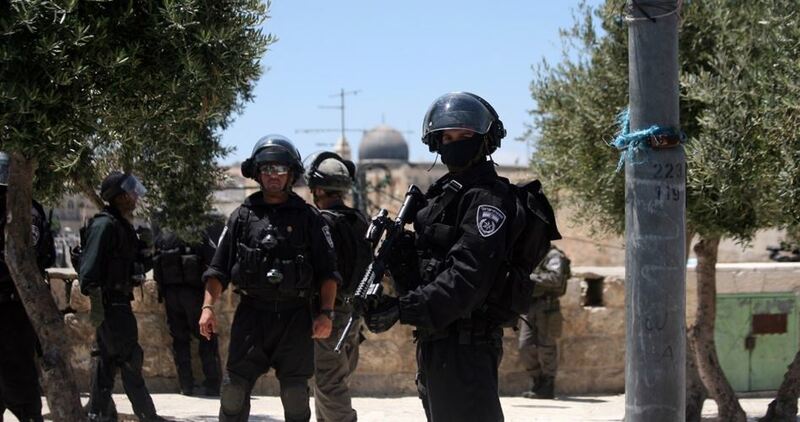 The Israeli soldiers deployed in the vicinity of al-Nabi Yunis Old Mosque while the Israeli settlers performed their Talmudic prayers in the area. Meanwhile, a number of Palestinian youngsters gathered and threw stones at the Israeli soldiers, who fired sound bombs and tear gas canisters at them. As a result, many stone throwers suffered tear gas inhalation and were then treated on the spot. At approximately 12:45 on Friday, 27 July 2018, a group of Israeli settlers from “Yish Kodesh” outpost established in eastern side of Jaloud village, southeast of Nablus, attacked Palestinian civilians’ houses in al-Khila al-Wasta area, east of the village, 200 meters away from the abovementioned outpost. The Israeli settlers set fire to an under-construction house belonging to a civilian, from Kafur Qasem village in Israel. The 100- square-meter under-construction house was burnt. The Israeli settlers attacked another 60- square-meter house belonging to Tawfiq al-Showiki after destroying its main door and damaging its contents. On Monday morning, 30 July 2018, a group of Israeli settlers from “Adi Ad” outpost established on al-Magheer village’s lands, northeast of Ramallah, moved into the outskirts of the village from the northwest side. The Israeli settlers burned tires of 8 Palestinian vehicles and wrote racist slogans on the walls of the houses calling for revenge and killing the Palestinian civilians. The Israeli settlers later withdrew. Fully detailed document available at the official website for the Palestinian Centre for Human Rights (PCHR). The Journalists Support Committee documented during July 2018 a total of 102 violations against media freedoms in Gaza Strip and the West Bank. The Israeli Occupation Forces (IOF) committed 90 violations including arrests, assaults, and deliberate targeting with life fire. Whereas, 12 violations were committed by Palestinian parties. 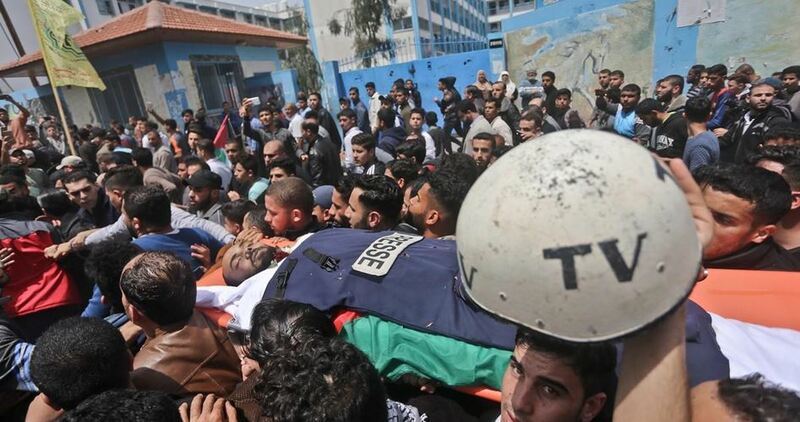 The report said that 28 Palestinian journalists suffered different injuries over the past month including 17 during the peaceful protests on the Gaza borders. The most dangerous violations were targeting 8 journalists with live ammunition and 8 others with teargas bombs that resulted in serious injuries and critical health conditions; this occurred during their coverage of the peaceful demonstration on the Gaza border. The report also documented seven arrests among Palestinian journalists at the hands of Israeli forces in West Bank. Other Israeli violations involved the raiding, confiscating, and sabotaging media outlets, including the shutdown of al-Quds TV on July 9, in addition to the extension of some journalists’ detention, house arrest. On the other hand, 12 violations were carried out by the Palestinian Authority, including the arrest of four journalists, the investigation summons of three others and the extension of two journalists’ detention. The number of Palestinians killed by Israeli occupation forces since the beginning of 2018 is 192, the National Committee for Palestinian Martyrs reported on Tuesday. The committee explained, in a statement, that 32 of the dead are children under 18 years old. 173 are from Gaza and 19 from West Bank. The most frequently targeted age group was 22 years of age, numbering 11, with 2 of them succumbing to inhalation of toxic gases. 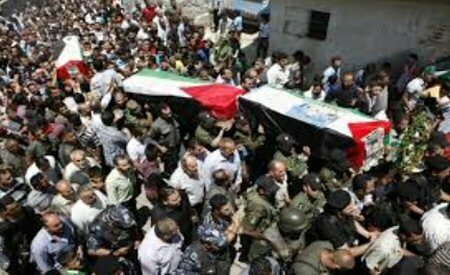 Israeli occupation forces also seized ten bodies of the slain, and 268 of those killed since 1965. The youngest Palestinian child killed is Layla al-Ghandour, eight-months from Gaza, and the oldest is Shaker Jabbareen, aged 60, from Hebron. The committee pointed out that the average age of men and women killed is 24 years and nine months, and, on average, during the period from 1/1/2018 to 31/7/2018, one Palestinian has been killed every 26 hours. This means that the number of dead doubled during this year, compared with 2017, whereas the number during the year 2017 totaled 76, at the rate of one every 115 hours. At the beginning of the year 2018, the Israeli Knesset approved a law for annexing academic institutions within Israeli settlements constructed in the occupied West Bank (e.g. Ariel University and the 2 Education faculties in the Akena and Alon Shvut settlements) to the Israeli Higher Education Council, knowing that the above mentioned law is a part of the annexation policy led by the Israel Baitona party, which openly declares its intention to annex all “C” areas, constituting approximately 60% of the West Bank. Moreover, the Hebrew University in occupied Jerusalem held a conference, under the title “The Environment Behind the Green Line”. The conference was organized by the Environment College at the university, with participation from Environmental Minister Zeev Elkin and Nature Protection Authority Director Shaul Goldstein, among many other Israeli officials. To prolong the occupation and the enabling of settlers to confiscate more Palestinian lands, and intensify settlement efforts, as well as creating a state of geographical contiguity around Jerusalem, the Israeli government has approved the construction of 270 housing units in the illegal settlements of Daniel and Kfar Dadd, to the southeast of Bethlehem. It also approved the building of 170 housing units near Al-Khader town, to the south of Bethlehem as well as 100 units in “Kfar Dadd” outpost, located on the Ta’mra area, noting that 500 housing units in the settlement outpost of Dad were also added. 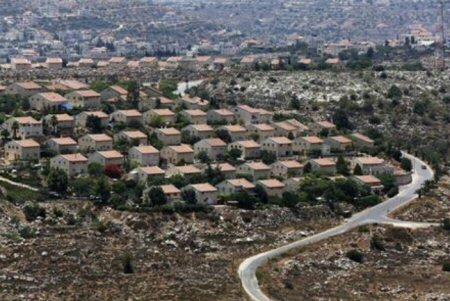 Moreover, the Israeli government has approved the addition of 20 new settlement units in the settlement of Metasad. At the same time, Minister of Defense Avigdor Lieberman decided to approve the expansion of the Adam settlement project, to the southeast of Ramallah, by building 400 new housing units. According to the National Bureau, US officials agreed to this measre. On the other hand, PNN further reports, the Israeli District Committee for Planning and Building in Jerusalem decided to carry out a plan to build a tunnel extending from the Hebron Gate to the Damascus Gate, in the Old City district of Jerusalem, at a cost of NIS 360,000,000. The National Bureau stated that the Israeli decisions are part of the government’s plans to satisfy extremist settlers, in light of the international silence on Israel’s crimes and violations of international laws, condemning these racist decisions which contravene international norms and charters. According to Khalil Tofakji, Director of Plans and Data System at the Arab Studies Association, it was disclosed that Israeli authorities are intending to transfer 2,500 land plots within the so-called municipal boundaries of Jerusalem, to public institutions in Israel, which means transferring their status from private property to state property, for public interest. This announcement coincides with an additional announcement of carrying out settlement operations in a number of Jerusalem neighborhoods, in order to occupy large areas of land. In Jerusalem, the Israeli government continues its policy of racial discrimination, as it has implemented a plan to identify, in mere weeks, special tourist routes for Muslims within the Holy City, extending from Damascus Gate to Al-Aqsa Mosque, in addition to establishing a new Israeli police monitoring station. On the 13th anniversary of the evacuation of settlements in the northern West Bank, 200 settlers returned to Sanur settlement, which was evacuated in 2005. MKs Shuli Maalem and Bettsiel Smutrich, along with about 200 settlers, entered the area under protection of Israeli occupation soldiers, saying that they will return to the settlements, as this is part of their ideology. In a maneuver to restrict citizens’ movement and push them to emigrate, military bulldozers destroyed the agricultural water lines in the northern Jordan Valley and leveled areas of land in Khirbet al-Ras al-Ahmar, east of Tammon town, under the pretext of constructing a military road for the Israeli army. Israeli occupation forces also closed water lines feeding the village of Froush Beit Dajan, to the east of Nablus, under the pretext that they were illegal, while additionally legitimizing the status of more than 100 illegal outposts.